According to the Joint Plant Committee (a unit set up by the Indian Ministry of Steel), India´s steel consumption in the fiscal year 2013-14 (in India the financial year runs from 1 April to 31 March) increased only 0.6% year-on-year, to 73.93 million tons: the slowest growth rate for four fiscal years. Exports grew 4.1% helped by rupee depreciation, while imports decreased 31.3%. Steel consumption remained subdued in the period April-July, with a growth rate of just 0.6%, while production increased 0.9%: unsurprising, in view of the slowdown in Indian economic growth. The industry has been hit by lower demand from end-user industries such as construction and automotive, which between them account for almost 75% of domestic steel demand. As a consequence, profit margins have shrunk over the last 12 months. On a positive note, the new government under Prime Minister Narendra Modi has recently announced some initiatives that could help the sector: large infrastructure projects, including city and sea port development, power plants, pipelines, metro for tier 2 cities, a revival of Special Economic Zones and incentives for housing. The government has also announced an increase in import duties on flat-rolled steel products from 5% to 7.5% which is expected to provide major relief to the domestic stainless steel industry, which suffers from underutilisation of capacity and increased imports from foreign competition. The Finance Minister also made a commitment to amend the Mines and Minerals Development and Regulation (MMDR) Act of 1957 in order to resolve the existing impasse in the coal and mining sectors. However, the government has also proposed an increase of 2.5% in the basic customs duty for coking, steam and bituminous coal. Since over 90% of India’s demand for coking coal is met through imports, a hike in import duty on coal is likely to increase production costs in the steel industry, which could be difficult to pass on to customers. As a result, steel industry leaders have demanded a reconsideration of the import duty initiative. While international coking coal contract prices have decreased, this benefit has been largely offset by last year’s steep rupee depreciation. Although the exchange rate has stabilised somewhat in recent months, any further rupee depreciation could increase production costs, thus driving down margins. Domestic steel demand in India is expected to increase in the 2014-15 financial year on the back of a gradual economic rebound and the infrastructural improvements planned by the new government. The World Steel Association has forecast that steel demand in India will grow 4.5% in 2015. However, steel prices are not expected to increase due to persistent overcapacity in the domestic steel market. 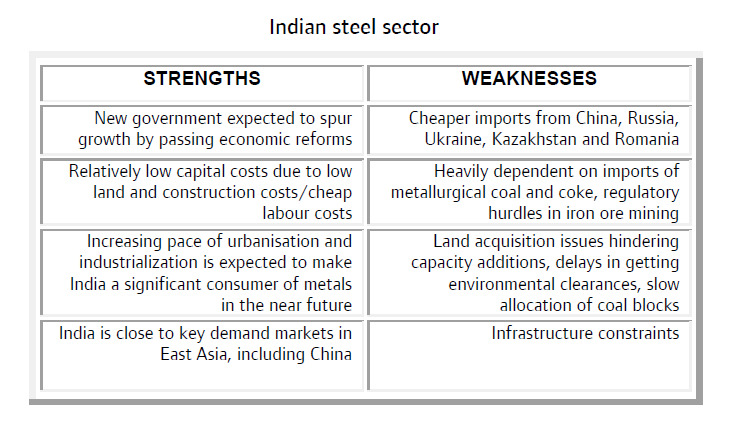 Other major challenges for the Indian steel and metal industry remain land acquisition issues in setting up Greenfield projects, delays in environmental clearances for mining activities, logistics support, security of raw material supply, higher raw material costs, and the increase in cheaper imports. On average, payments in the Indian steel/metals industry have remained unchanged since last year, taking between 60 and 90 days. We have received very few credit insurance claims in the last three years and, based on our experience to date, we do not plan any imminent major change in our underwriting approach as we do not expect any major increase in payment delays or insolvencies. 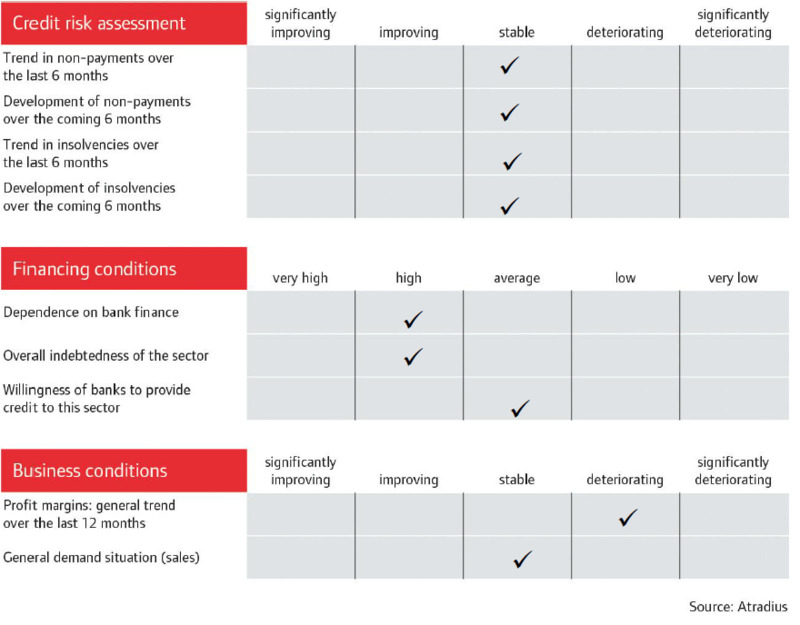 We are of course prudent in underwriting this sector: to accurately assess credit limit applications we always require up to date financial information and, more importantly, details of up to date trading experience with buyers in order to assess actual requirements and monitor any changes in payment behaviour. We also assess the strength of the customer/buyer relationship. On those occasions when the amount of our customer’s credit limit application exceeds our assessment of the buyer’s creditworthiness, we still try to approve as high a credit limit as is reasonable. As securities in the form of guarantees to trade suppliers are fairly unusual in India, we would not expect our customers to take on the difficult or even impossible task of seeking such security. Instead, we would tend to agree to a proportion of amount applied for, and always explain to our customer our areas of concern and the information we would need to reassess the application. We would generally not encourage customers to lengthen their normal terms of payment. Growth in the Indian car sector has returned after two years of slowdown, and sales are expected to increase further with higher demand from the automotive sector. A proposed elimination of customs duty on auto components should benefit the sector.